The flu and cold season is upon us and this week I got hit HARD and now my baby girl and my husband are starting to feel the effects too. Not only do we not feel great, but I have little energy in the evenings right now to prepare complicated meals. 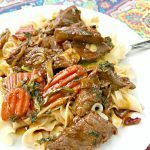 SO today I thought I’d share with you a simple dinner idea that I have relied on before that’s a simple concoction to throw together and is equally tasty! 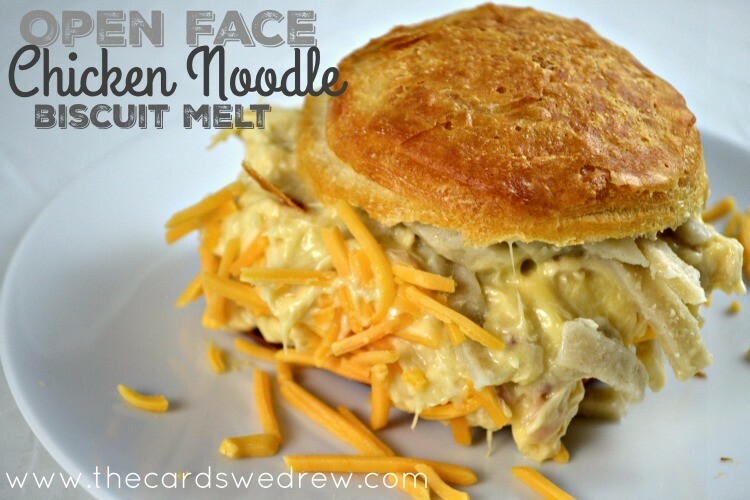 Let me introduce the Open Face Chicken Noodle Biscuit Melt! Say that ten times fast!! When I was a kid my mom used to make this for us, but she put it over rice. I thought why not kick it up a notch and take this to a WHOLE NEW LEVEL and add a country meal appeal to it for about half the effort that a down home country meal necessitates! Start by making your biscuits in the oven according to instructions. While your biscuits are cooking, put some water on to boil to add your Reames Homestyle Egg Noodles to once it’s boiling. Follow instructions on preparing noodles. In a separate pot, heat up cream of chicken soup and shredded chicken until warm on the stovetop. Add salt to taste. For my chicken, I used three chicken breasts cooked in the crockpot with some chicken broth while I was at work. I used half the chicken for this recipe and froze the other half for another day. Once all your “materials” are ready (i.e. 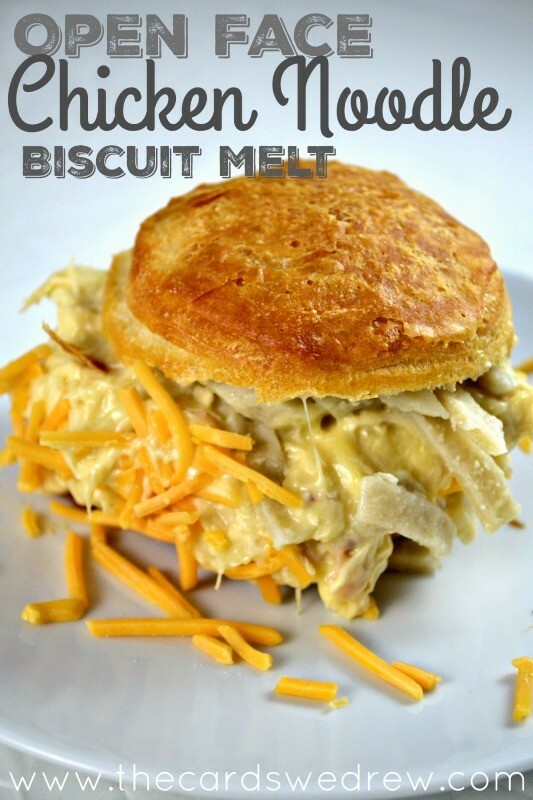 the biscuits are baked, the noodles are cooked, and the chicken soup mixture is warm) then you make your sandwiches! Let’s check out how easy these are to make…. 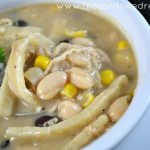 SO simple and easy and the mixture of thick hearty noodles and the chicken soup….oh it’s tasty!! And filling. 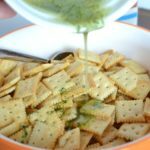 Your family will love this little creation and it’s great served with a side of green beans or corn. 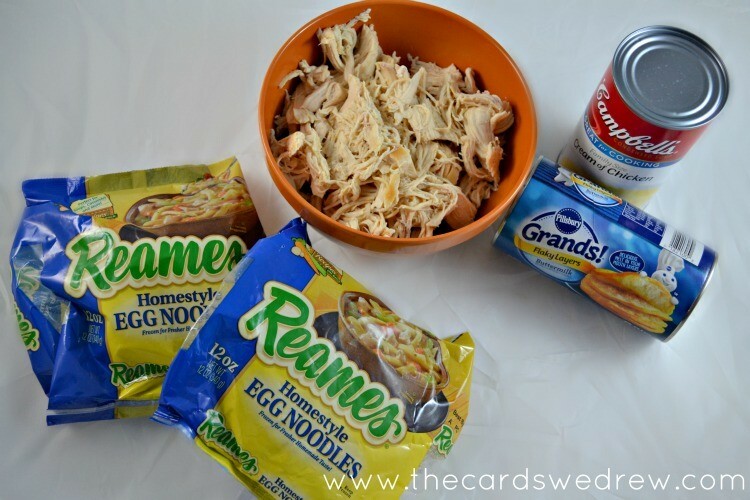 Reames noodles puts the heart in hearty. 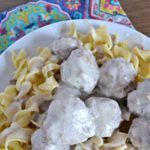 So when your family is feeling under the weather or needs some comfort food, this recipe will help pull you out of your seasonal cold FUNK and fill your belly quickly. And today, Reames wants to give you EVEN MORE reason to smile with a giveaway for a $50 Gift Card! Entering is easy, enter below for a chance to win!! This recipe sounds so easy and good. Pot roast, carrots and potatoes in the crock pot! Been my favorite since I was little! Recipe looks delicious!! I like beef stew, nice and hearty!! Yummy! My go to meal is grilled chicken, steamed veggies and baked potatoes. I have always made red beans and rice with biscuits. My family has been making this for 20 years.